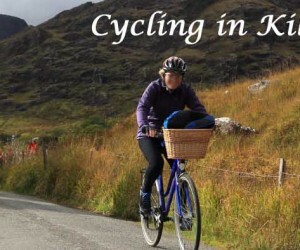 Cycling in Killarney National Park you can rent Bikes locally in the Town or at Flesk Caravan & Camping Park on the Muckross road near the Killarney National Park. 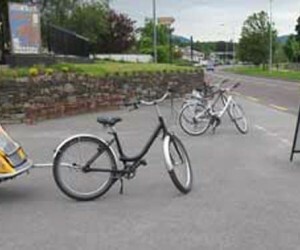 Dave Sheehan’s bike rental is in an ideal location to access the Safe Jaunting Car / Walkway / Cycle path leading into the National Park. 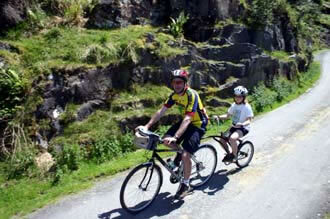 You can also rent bikes in Killarney from O’Sullivan Cycles and Lynes on the Muckross road. 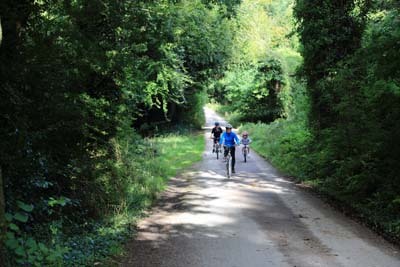 Its more or less flat, its 10 miles / 16 km and very scenic. 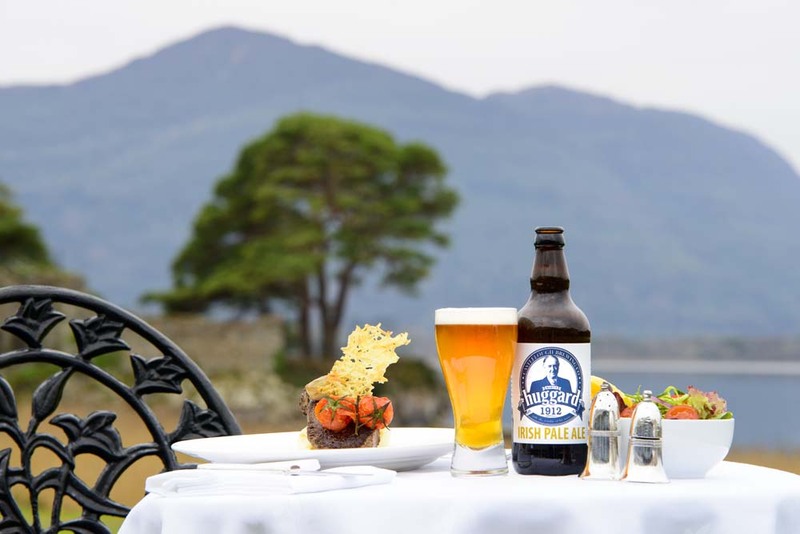 You will pass the Magnificent Abbey that is Muckross Abbey (1448.AD), The Colleen Bawn Rock, Old Copper Mines, Brickeen Bridge, Dinis Cottage and the Meeting of the Waters. You can walk over the Old Weir Bridge its very scenic, Arbutus the Strawberry Tree grows here in abundance, when ripe its red otherwise you will find Yellow berries. So its back on the bikes and you will arrive at the Main road with cars and buses so be careful for 500 meters before you arrive at Torc Waterfall. Now you can pass the toilets and go under the little tunnel under the road and you are back in the Park with no cars or buses. 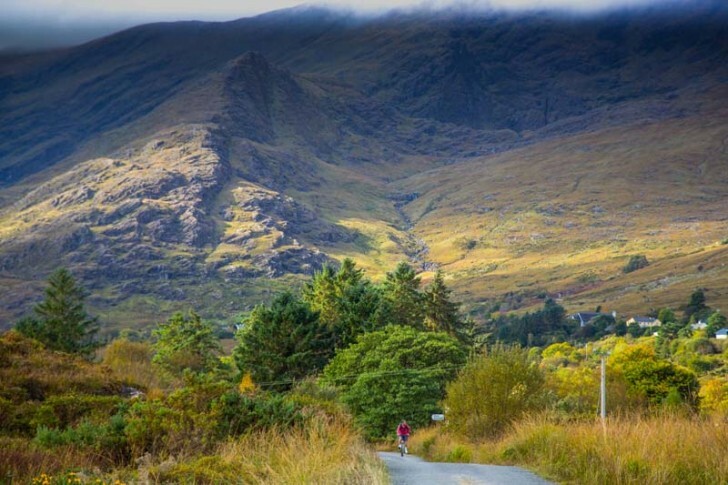 After 500 meters on the left is Dundag Beach a freshwater beach popular with locals in hot weather, next on the left id the Muckross Boathouse before you arrive at Muckross House & Gardens. 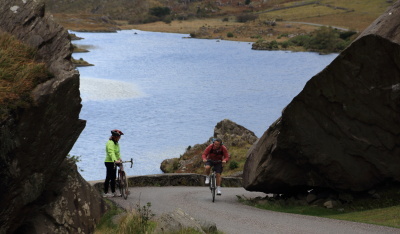 The Gap of Dunloe, starts at at Kate Kearney’s Cottage, heading up the gap to the Head of the Gap, on to Lord Brandon’s Cottage, hop on a Boat with Bike travel 22 KM’s to Ross Castle. or alternately go to Moll’s Gap, Ladies View and Muckross House by road. 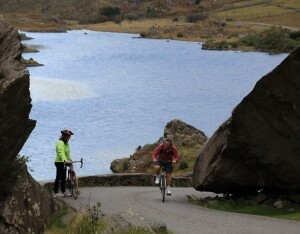 This magnificent Trip can be Booked locally at your Accommodation in Killarney. 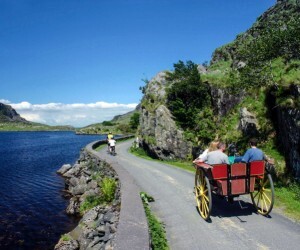 Starting at Saint Mary’s Cathedral enter the National park through the big gates across the road, there is a beautiful Thatched Cottage called Deenagh lodge which is a tea room and serves refreshments, Pass the front door and straight down the hill until you meet a small bridge, turn right and stay on the roadway until you eventually meet another turn go right and follow the signs for Ross Castle. 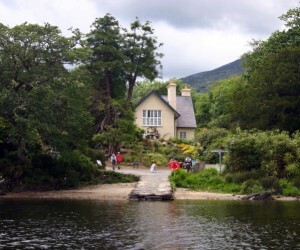 At Ross Castle you can visit the Castle, take Boat trips on the Lakes, Visit Innisfallen Island, even hire your own boat to row around the Bay of Ross. 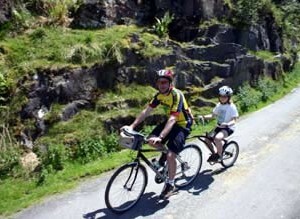 If you cycle past the Castle you will arrive at the Old Copper Mines, look out for the green water in an old mine shaft. 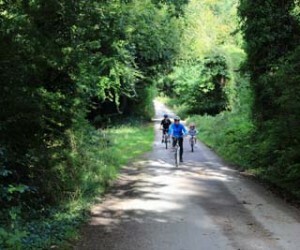 Governors Rock and Library Point are worth a visit the pathway becomes a dirt path so care is advised. 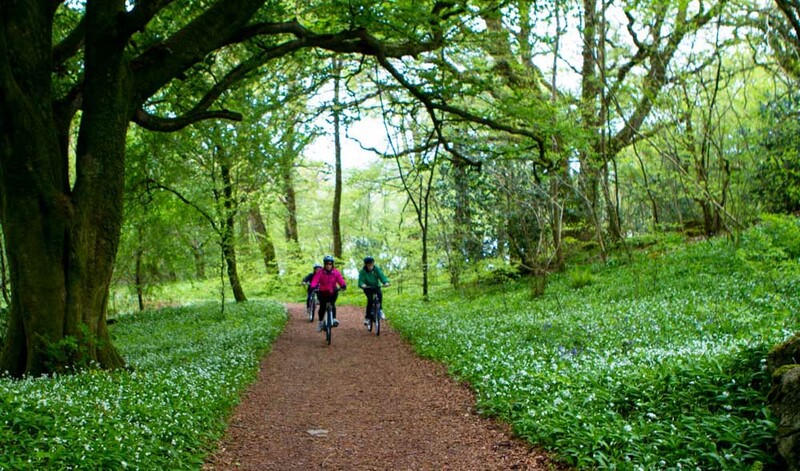 If you are lucky enough to be here in Spring time you will see an abundance of Wild Garlic and Bluebell’s all over Ross Island.